Metal Dragons. They have sent people to the bank, crying with joy... And to their respawn points, with only three items. You may ask why you are taking such a big risk. First you have to buy the correct items, costing hundreds of thousands of your hard earned coins. Then you have to buy food, potions, teleports etc. So, why would you risk all of this? To fight the fearsome Metal Dragons. There are four kinds of metal dragons in RuneScape. Bronze, Iron, Steel and Mithril dragons, ranging from levels 131, 189, 246 and 304 respectively. They all drop Dragon Plateskirts, Platelegs, but only iron, steel and mithril dragons drop the fabled Draconic Visage, worth millions. Mithril dragons also drop the dragon full helmet, a very rare drop indeed. Are you ready to kill these beasts? This guide will tell you everything you need to know about hunting metal dragons. 70+ Attack, Strength, Defence and Constitution - Without that, you won't do much damage. 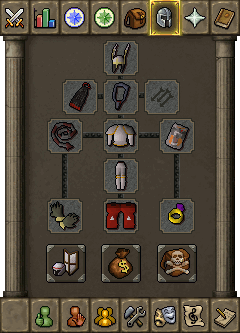 43+ Prayer - You will get slaughtered without Protect from Melee. 80+ Attack, Strength and Constitution - They are level 304, so those are just the bare minimum to be able to do damage. 80+ Defence - If you are melee'ing them, you won't get far without this and protect from melee. 60+ Magic - Increases damage done to dragons. You should use the best spell you can. Anti-Dragon shield - Requires dragon slayer to be started. You will get slaughtered if you don't bring one. 61+ Ranged - For the Rune C'bow... You can only use crossbows or knives so you can wield an anti-dragon shield. Anti-Dragon shield - Again, you will be killed without it. Note: Anti-Dragon shield can be replaced with a dragonfire shield, though it is more expensive. To kill metal dragons, you will need the right equipment. Below is the suggested equipment to kill metal dragons using magic, melee and ranged. Gloves: Barrows -> Any other gloves that don't have a negative impact on your stats. Its okay if you don't have any. 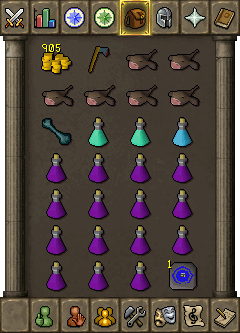 10-15 Prayer potions (4) - If you have over 70 prayer and are using good prayer equipment, you can bring less prayer potions. It all depends on how long you want your trip to be. More prayer potions means longer trips. 4-6 Antifire potions (4) - Again, the more you bring, the longer the trip will be. Axe - Required to cut through the vines in Brimhaven dungeon. Super Attack and Defence Potions - For lower levels, mainly if your combat is under 90. Food - Bring a lobster or two, just in case you get hit by any of the monsters on the way. 905 Coins - To get there is 30gp and to get in the dungeon you need to pay 875gp. Required for all methods. Teleportation Method - Bringing a teleport tablet is highly recommended, for a quick way out of the dungeon when you are done, or if you get in trouble. Optional: Holy Wrench, to increase the effect of the prayer potions. 1-2 Prayer Potions (4) - Not required, but using protect from melee on the way to metal dragons will stop any damage from being dealt en route there. 10-15 Antifire Potions - When you fight metal dragons with ranged or magic, you don't get close to them. You stay one step away from them, and all they will use is their fire breath attack. They will not approach you, so all you need is an anti-dragon shield and antifire potions. Runes: You should be wielding a staff of the runes used most in your spell. Use the best spell you can use. Food - Again, just in case you get hit on the way there. Magic Potion - Not required, but will help for lower level magicians. Teleportation Method - Again, a quick way out when you are done, of if you get in trouble for whatever reason. 1-2 Prayer potions (4) - When you fight them you don't need to use prayer (explained further below), but it will deflect any hits on the way to them. Food - Just in case you get too close to the dragons, or get hit on the way there. Ranging potion - If you have less than 70 Ranging, this is recommended so you hit higher. Not required, but it will help. Teleportation Method - A quick way out when you are done, or if you get in trouble. Mithril dragons are the most dangerous of all of the metal dragons. They are not found in the Brimhaven Dungeon like bronze, iron and steel dragons. They are found in the ancient cavern, and can be gotten to after you complete the firemaking part of barbarian training. They attack with magic and melee, both just as deadly. You must have the proper stats and equipment, so you best prepare yourself wisely. When fighting them, you should use either melee or range. Magic is not recommended, because dragons have a high magic Defence bonus. Try and follow the recommended setup below. Games Necklace - To teleport to Barbarian Assault. This is the by far the fastest method. 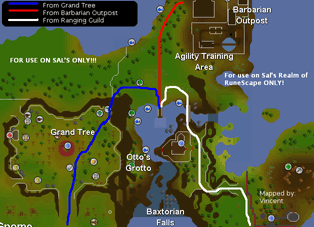 Unless you want to use spirit trees to go to the Tree Gnome Stronghold and use the agility shortcut, you should bring a games necklace. 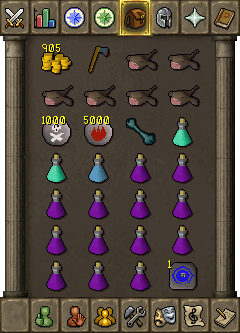 This can be banked at barbarian assault. 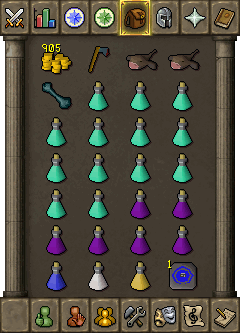 Prayer Potions - Depending on how many you want to kill you should bring between 4-8. This also depends on your prayer level. The higher your prayer level the less you need to bring. Antifire Potions - These are not required, but highly recommended. They will guarantee that their fire breath is worthless on you. Beast of Burden - This is optional, but if you want a longer trip, you can bring a Bull Ant, Spirit Terrorbird or any other BoB. A bunyip will also greatly help you here. See note below. Teleport Tablet - This is required. All levels should bring one, just in case you get in trouble. Diamond Bolts (e) - These are for finishing the dragons off. If you brought Ava's Accumulator, you should be able to get some back from the dragon's respawn spot. Food - Fill the rest of your inventory with high healing food, no lower than monkfish. Note: Familiars cannot be taken through the whirlpool; they must be summoned once you are inside the cavern. Use the same inventory setup as the melee setup. To get to metal dragons you need to bring 905 coins, or 875 coins if you are already on the island. 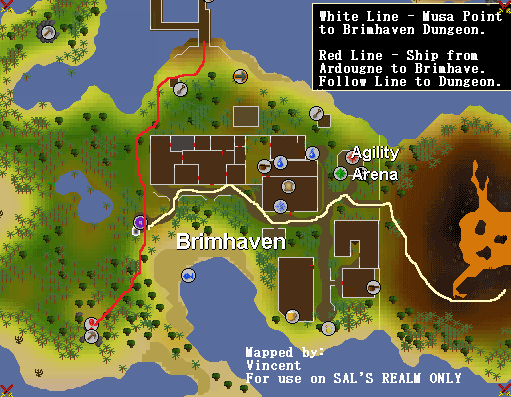 The dungeon is located to the south-west of Brimhaven. You must pay 875 coins to enter the dungeon, and will need an axe to cut through the vines. A rune axe is strongly recommended. 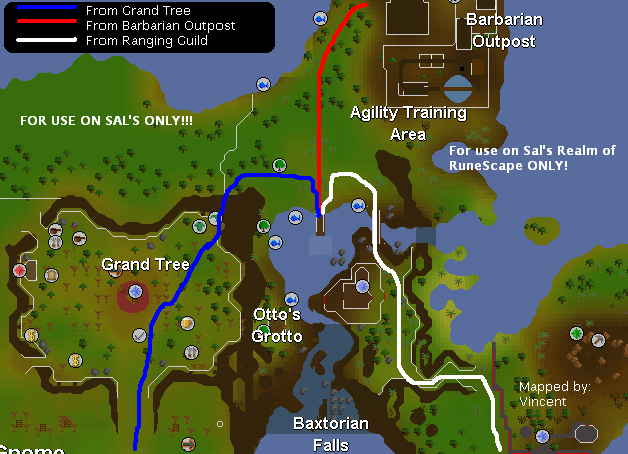 If you have Karamja Gloves (3) you don't have to pay the entrance fee to the Brimhaven Dungeon. Follow the lines to get to the dungeon. 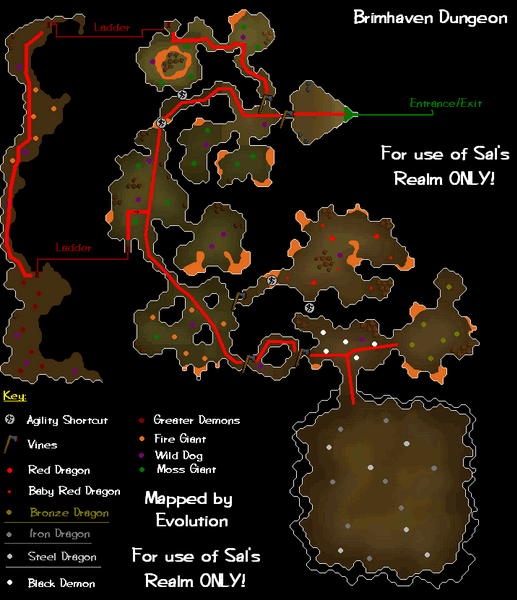 Once inside the dungeon, follow the map to get to the metal dragons. Once inside, you must head to the south-west most part of the dungeon. Climb up the ladder, and you will be in the upper level of the dungeon, with the mithril dragons. It is recommended to skip over bronze dragons entirely, unless they are your slayer task. They have an extremely low chance of dropping a dragon item, even lower than iron and steel, so just skip them. Before you chop the final vines to enter the room with the black demons, take a drink of your antifire potion, and turn on protect from melee. Chop through the final vine, and go into the room with the iron and steel dragons. If you are a warrior, keep protect from melee on, drink any super sets you may have, and attack the metal dragons. Make sure that you keep your prayer up. 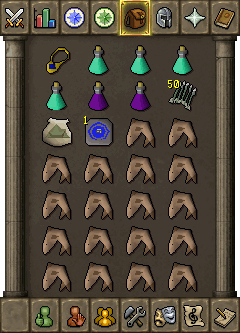 It is recommended that you take a sip of your prayer potions before you get below 10 prayer, in case something happens. For rangers and mages, do the same, except when you attack the metal dragons, make sure you stay at least one square away from them. They will not approach you. They will use their dragon breath on you, so make sure that you watch out for when your resistance to dragon fire will run out. That is why you have so many antifire potions. 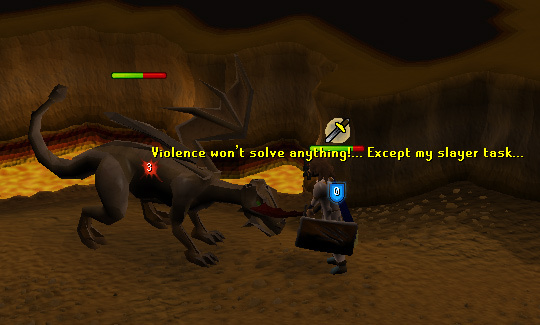 When your resistance to dragon fire is about to run out, a message will appear in the chatbox. When it says: "Your resistance to dragon fire is about to run out," take a sip of your antifire potion. Finally, never approach them. If you do, they will melee you, and if you don't have protect from melee on, you will be slaughtered. Before you climb up the ladder, turn on protect from magic. Once you have climbed up, rangers should stand next to the path to get to the dragons. You should be able to see the mithril dragons and their Life Points bar. Make sure you keep an eye on your prayer, and heal when you need to. Warriors should also turn on protect from magic, or melee, before they climb up the ladder. Once you do so, run down the path and attack the mithril dragon. Make sure you watch your prayer and health, and drink a potion when you need to. When they die, pick up the loot, turn off your prayer and drink any potions, or heal if you need to. When you are finished, teleport out, and sell your loot. If you wish, repeat the process. Metal dragons are a great, but risky source of income. They are fun and have great drops, and require a good deal of preparation and skill to fight. These beasts ranging from level 131 to 303 are extremely powerful, but following this guide will greatly reduce the risk, and increase your chance for success. Whether you are killing them for a slayer task, or just to see what it is like, metal dragons are mighty beasts, not to be taken lightly. Thank you for taking the time to read this guide, and good luck killing some metal dragons!